No matter how exact I am with my pen lines and how frequently I clean my scanner, I can never seem to get a completely clean scan -- there are always dust particles or stray strokes. I'm all for texture in digitization, but I like to be in control of it! If you're working with a piece where all of the lettering is connected, it can be pretty easy to just select your lettering, right click > Select Inverse and then delete the rest. But what about a bigger, more complicated piece? It's annoying and time consuming to shift and click to select every single bit of what you want to keep. I've developed a quirky little trick that makes spotting (and erasing) those pesky stray pixels a breeze! Start with a freshly scanned piece of lettering. Make sure you isolate your lettering by deleting all of the white areas. If your lettering piece is filled in, you can just select a large white area, right click > Select Similar, and delete (make sure your layer is not the background layer, so it will delete to transparent). If your lettering isn't filled in and you want to keep the white inside, you'll have to shift + click to select each area of white you want to erase. 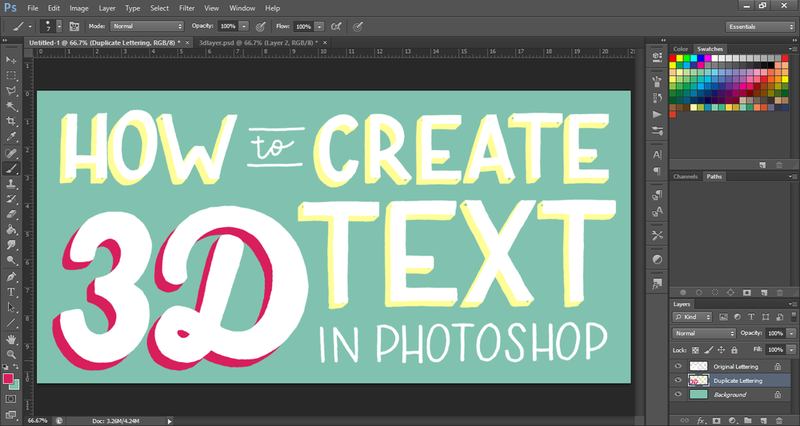 If you need a more in depth refresher on this, check out my Digitizing Lettering in Photoshop tutorial. Now that your lettering is isolated, there's still some cleaning up to do! Go to the layers panel, right click, and select Blending Options. When the Blending Options panel pops up, click Stroke on the left hand side. My default settings happened to be 25px of black stroke. See how instantly, you can see all of the stray pixels and dust much more easily? Click ok, and get on erasing those puppies! Making all of those circles disappear feels like a game to me - it reminds me of chasing and popping bubbles as a kid. I like to use this stroke effect to spot all of the bits of dust on my scan, but also to spot some areas of my lettering that has a rougher edge than I might like. If the stroke looks really jaggedy, it's because it's basically exaggerating the existing edge of your lettering below. It can be tough to erase precisely when the stroke is turned on, because you actually need to erase inside of the stroke to clean up the edge, so I just use this to note areas I need to look more closely at. Once you've cleaned up all of the dust and particles, right click on your layer in the layers panel, and click Clear Layer Style. This will get rid of the stroke and you'll be left with clean, isolated, dust-free lettering! From here, it's easy to continue digitizing and make the type 3D! Or, you can take it into Illustrator and try out Image Trace, but that's a tutorial for another day. Now that you know this fun little trick, you'll never have to worry about the dust particles you can never seem to fully clean off of your scanner! At home, I’ve got a great lettering set up. I’ve got a nice big desk, a comfy chair, and drawers of storage so all of my (many) art supplies are right at my fingertips. But some months it seems like I spend more weekends away from home than not, which can make continuing to practice lettering tough, since I can’t take my entire home office with me! Over the years, I’ve developed a travel lettering kit that is full of essential supplies to make sure I keep practicing, whether I’m spending the day at the park or a week in another country. Moleskine notebooks have an outstanding reputation for being a great sketchbook. Beyond containing high-quality drawing paper, they also have the added benefit of an elastic closure and a hard cover. I love that the notebook stays securely closed, protecting my drawings and blank pages from getting crumpled in my bag! If you go with a gridded or dotted notebook, you can probably even get away without packing a ruler in your travel supplies. I use an old makeup bag as my pencil bag, and it’s the perfect size. And it didn’t cost me any additional money, so bonus! If you have an old pencil pouch or makeup bag lying around, use what you have. This bag fits all of my basic supplies and more, so I have enough supplies with me even for a long trip. I keep a dedicated set of Micron Pens in my travel bag so I never forget a size! I use the smaller sizes for fine details and the larger sizes for fills and larger letters, so I like to keep every size with me, including a Graphic 1 for big fill areas. I don’t like to bring #2 pencils with me on trips because without fail, the lead snaps. I have a sharpener to fix that, but the frugal person in me always gets frustrated over wasted materials. With a lead holder, I can slide the lead fully into the the holder when I put it in the travel bag, so the tip is fully protected. No wasted lead! Plus, if I’m going on a very long trip, packing extra lead takes up less room than an extra pencil. Obviously, you’ll need to bring a way to keep your lead nice and sharp! The standard Staedtler lead sharpener is the perfect size to store in my pencil bag. If you want an even smaller option, this tiny little guy takes a little more effort but does a pretty good job! You’ll definitely want to bring an eraser to fix any stray lines, particularly if you’re going to attempt lettering in a car, train, or plane (turbulence be damned!). Any small eraser will do, but I like my Faber-Castell eraser that has a plastic enclosure. It protects my eraser from getting covered in ink should an accident happen in my pencil bag! Plus, when you have the eraser open the plastic casing gives you more surface area to grip. I have a 6-inch metal ruler from college that has come in so handy for travel. It fits perfectly in my bag and is long enough for nearly all of the layouts I’d be tackling in a 5x8.25 Moleskine notebook. I find a metal ruler is best for travel because it’s flexible but sturdy, so it can handle being tossed around a bit in a travel bag without breaking. Since I’ve got the room for it in my pencil bag, I always toss in a few brush pens for the road so I can stay on top of my brush calligraphy skills as well. Right now, I’ve been favoring Pentel Sign Pens or the Zig Cocoiro, but this option varies trip to trip! When travel interrupts your routine, it can be easy to decide not to stick to a practice regimen. No matter where you’re going, this small lettering kit is sure to fit in any bag you bring. So no excuses - keep practicing! What can’t-live-without lettering tool do you bring on trips? Are You Correcting For This Optical Illusion in your Lettering? I’ve emphasized the importance of guidelines in many of my posts, but one mistake many new letterers make is setting up guidelines and following them too strictly. Setting up your guidelines and drawing every letter precisely to the edges of your guides sounds like a foolproof plan, right? Well, not exactly. Thanks to a little optical illusion known as the Müller Lyer Illusion, your letters will actually end up looking like they’re different heights, and thicker in some spots than others. So how exactly does this affect your lettering, and how do you fix it? All characters can be lumped into one of these three shapes: squares, circles, and triangles. Square shapes, like H and M, are relatively simple - they can follow the baseline and cap height and have no problems at all. Circular letters like O or C look shorter than square letters. Triangular letters, like A, tend to look even shorter than circular or square letters. Take a look at the image above. Do you notice how less of the circle and triangle touches the cap line? This is what causes the illusion. When characters are mathematically the exact same height, they don't actually look like they are. When you’re drawing a circular letter or a triangular letter, you’ll need to adjust for this by drawing circles and triangles a bit taller than your guideline - this is called overshoot. If you don’t, circular and triangular letters will look smaller even if they are the same height as square letters. Horizontal lines, like the crossbars of A and H, look heavier than verticals. To adjust for this, make them a bit thinner than the other strokes of the letter. Working with only outlines of your text can make it tough to accurately get a feel for the visual weight of every stroke. Filling in your lettering can help you really see how heavy your letters are, so you can tell if you’ve successfully outsmarted the tricks our brains play on us. If you’ve been noticing that no matter how exact you are with your guidelines, some of your letters seem to look smaller than others when you’re finished, don’t fret! After you learn to make a few small corrections to your lettering, you’ll be outsmarting our silly, broken brains. If you make these adjustments, your letters will look even, and you’ll be the only one who knows they’re actually not! 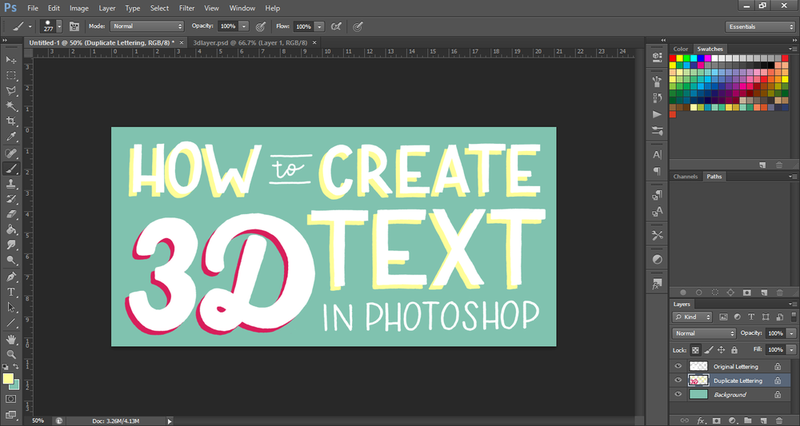 Giving your lettering a 3D effect in Photoshop adds a lot of visual impact, but it’s easier than you think! Today I'll show you exactly how I made the featured image for this blog post. Start with your lettering scanned, cleaned up, and isolated in a Photoshop document. If you don’t know how to do this, start with my basic digitizing your lettering in Photoshop tutorial, and then come back! Duplicate your lettering layer (right click on the layer in the layers panel and select Duplicate Layer), move it underneath the original layer, and nudge it to the depth and angle you’d like. I typically go down and to the left, but you can go any direction! Erase any duplicated lettering that you don't want to make 3D. I typically only make my most emphasized phrases 3D, so I'll erase the rest from this layer. Pixel lock both layers of lettering, and find a color scheme you’d like to work with. If you’re struggling with color schemes, I love coolors.co. I generally make the lettering layer that’s going to give the 3D effect a darker color than the top lettering layer, to add to the effect. Sometimes I'll make the top layer white, and other times I'll make it just a much lighter version of the 3D color. The world is your oyster! Un-pixel lock the darker layer of type. Using a small brush, draw lines to connect the second layer of lettering to the original in front of it. I either do this freehand, or I’ll create a sort of guide with the Rectangular Marquee Tool. If you don’t have a steady mouse hand yet, use the marquee tool to select a square area. Right click, and click Transform Selection (not Free Transform - that will transform the area of your work you’ve selected, not the square itself). Rotate the square until the angle matches up perfectly to connect your two lettering layers. Then you can just follow along the line with the brush tool to connect the layers, and move the square to each connection spot as you go. Deselect the area when you're done with this step, and then use a larger brush to fill in the remaining inside your 3D area with the same color. Create a new layer above your 3D layer (CTRL/Command + Shift + N), and select "Use Previous Layer to Create Clipping Mask" in the box that pops up. The new layer should indent a bit to the right and have an arrow that points down to your 3D type layer. Now, no matter where you draw on that layer, it will only show up if it’s inside the colored areas of your 3D layer. This is where we’re going to add some shadows to make the depth more realistic. Grab a darker shade of the color of your 3D lettering, and use the Brush Tool to paint in shading on top of your 3D lettering. I generally imagine the light is coming from the upper left hand side, which means everything on the underside of a stroke needs to be shaded. I use a hard brush for spots that should have no transition, like the bottoms of the letters, and a larger, softened brush to fade the shading a bit on rounded areas or strokes that I think are half in shade and half not. Once you’re happy with your shading, there’s one last detail - a shadow. Select all 3 layers of your lettering, duplicate them, and merge those duplicates into one layer. Move that layer beneath all of the other layers of type, just above your background layer, and nudge it to offset it from your lettering a bit. Just like in the 3D layer, erase any lettering you don't want to have a shadow from this layer. I again don't want my accent pieces to have a shadow, so I'll erase them. Pixel lock the layer and grab a darker version of your background color and color in the lettering. Then, drop the opacity until it’s a soft, subtle shadow. This is usually around 20-30% for me, depending on the color. Voila! Now you have beautiful, colorful 3D lettering. And if you keep all of your layers separate (and labeled), it’s easy to tweak your color scheme or add additional effects, like texture. Typography. Lettering. Calligraphy. Fonts. Typefaces. Handwriting. There are so many words for how we visually represent language! As these areas have increased in popularity, many designers have added one or more of these skills to their arsenal. This, along with the rise of using computers to create work, has caused a lot of confusion about what each one means, how they are different, and what they have in common. Many of these terms are often mixed up, but they are not interchangeable. They have distinct meanings and each represent a specific discipline and skillset. They do share some commonalities, and even frequently draw inspiration from one another (lettering styles often imitate typeface styles, and some typefaces imitate a calligraphic style, for example). Typography, lettering, and calligraphy all rely on similar principles, like character spacing and consistency in weight and contrast, but they approach these principles in very different ways. Let’s take a look at what’s what! Lettering is the art of drawing words (whether on a computer or with a pencil, pen, paint, or some other artistic medium), rather than writing them or typing them. A lettering piece is the result of sketching many layers of detail to create a final piece, just like figure or still life drawing. This gives designers freedom to experiment with ligatures, flourishes, and ornaments to create a truly one-of-a-kind piece. Lettering is made up of multiple strokes, not always following the natural flow of writing. This is very unlike handwriting or calligraphy, which create letters and words in a single pass. The words in a lettering piece are drawn for a single design only - nothing is meant to be rearranged or reused. When you create a lettering piece, you only create the characters you need, rather than the entire set of letters, numbers, and symbols. Calligraphy means "beautiful writing", and that describes it pretty accurately. Characters are written with only a few strokes, rather than through drawn layers like in lettering. As it involves creating characters in a single pass (even if a character is broken up into a couple of strokes), calligraphy is much closer to handwriting and penmanship than to drawing. I like to think of learning calligraphy as very similar to learning an instrument. Calligraphy involves a specific tool set (dip pens, fountain pens, or brushes) and is a skill developed through regular, structured practice. Like playing the violin, true calligraphy has a strong emphasis on muscle memory. Note About Brush Lettering/Calligraphy: Brush pens are an area where the terms lettering and calligraphy are most often mixed up. If you use a brush pen to write script in a single pass (even if it's multiple strokes), you are actually practicing calligraphy techniques, but this is also commonly referred to as brush lettering. It confuses the issue, but c’est la vie. Where Do Typographers and Typefaces Fit In? A typeface is a set of characters made to be reused over and over, in endless configurations and combinations (eg, Arial, Georgia, etc.). Typefaces can have stylistic alternates and ligatures, so you can mix up how characters look and imitate some of the variety available in lettering, but repeated letters are identical. Typeface design is a highly skilled, technical endeavor, and much more focused on perfection (even if the goal is for the typeface to look a little imperfect!). Quick Note: A font and a typeface are not technically the same thing, although merging the terms is becoming more widely accepted. If you want to get really nerdy about it, this is a great explanation of the difference. Handwriting is using a writing utensil to forming letters and words in a single pass. Handwriting typically demands the least focus on principles like spacing and consistency (though those with great penmanship may disagree!). The goal of handwriting is communication, focusing on content rather than artistic form. Some people use their own handwriting as an accent in lettering work, but writing words is not lettering. Hopefully that clears up any confusion! With the recent growth of many of these areas of design, it’s important to understand what’s what. Whether you’re interested in learning one of these crafts or interested in hiring someone working in these fields, it'll keep you from looking silly! And it will help you find the most suitable resources for what you’re looking to learn or commission! Serif styles are one of the staple classifications of typography. A serif is that little extra stroke found at the end of main vertical and horizontal strokes of letterforms. Georgia is an example of a serif. Arial is an example of a sans serif. Serifs have been classified many different ways, but the terminology gets confusing. There are a lot of overlapping terms for the same types of serif, which can make knowing what's what as clear as mud. Over time, the terms for different serif styles have evolved, but confusingly, the old terms are still used (resulting in multiple names for the same style). Let's try to clear things up! Before we get started, there are some important terms that we're going to be repeating. Contrast: In this case, we'll be referring to the difference between the thickest part of the letter and the thinnest. Other basic typography anatomy terms (this drawing from SeanWes is a great visual dictionary). Old-style serif fonts meant to imitate brush strokes of old school scribes, so they have a softer, rounded appearance. This serif style has smooth, rounded transitions between the thick and thin strokes, and the transition into the serifs (which have slightly rounded edges) is a very gradual, smooth slope. This type style has a hand-crafted look, rather than the sharper, more machine-made look of a transitional or modern serif. For a good example of this style, take a look at Garamond. Drawing this style is relatively easy, as imperfections are part of the historic, handmade charm of old style serifs. Draw a letter as you normally would, giving all of the body some weight. Then thicken the down strokes a bit - the contrast in this style of type is not very dramatic. 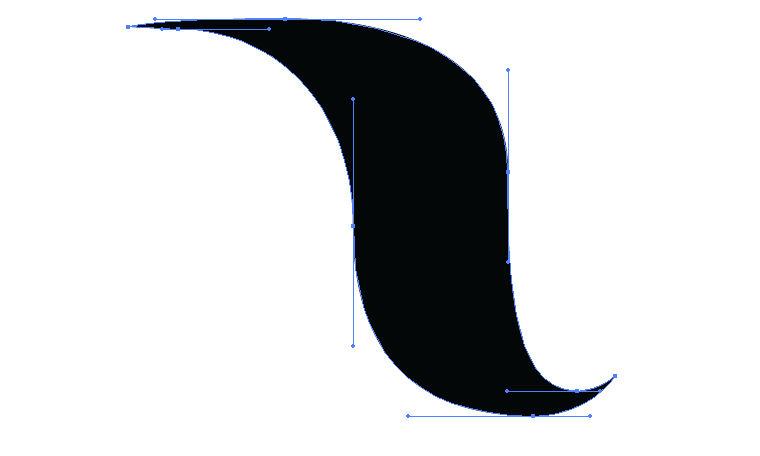 Then, draw a thin, rounded rectangle for each serif. If you look closely at Garamond, every 90 degree angle has been softened with a rounded edge, including the transition into each serif. Transitional serifs are more pronounced and sharper than old style serifs. John Baskerville was the English printer and typographer who pioneered this style thanks to some advances in printing methods, so Baskerville is a shining typeface example. The curved edge that connects the stroke and the serif is a bracket, so you'll often see this style referred to as bracketed. The brackets of transitional serif fonts are rounded and smooth but the edges of the serifs are very square. This type style feels much more machine made and modern, as the 90-degree angles and perfectly straight lines are difficult to achieve by hand. It's known as "transitional" because this type style is a big step toward modern styles, but keeps characteristics of old style serifs. Drawing this style is a little tougher as it demands more consistency than the old style serifs. Draw a letter as you normally would, giving all of the body some weight, and thicken the down strokes - the weight contrast in this style is more pronounced than old style serifs. Then, draw a thin, square-edged rectangle for each serif. Soften the transition into each serif with a smooth, rounded edge. The hairline serif is pretty unmistakable. It's a very high-contrast style between thick and thin strokes, with narrow, unbracketed serifs. This is the style I showcased in my Vectorizing Serif Lettering tutorial. This serif can be seen in type styles like Didot and Bodoni. Sometimes you'll see this style with ball terminals (as in the lowercase c and a in the image above), but otherwise, this style maintains a very modern, clean, unornamented appearance. This style has probably gone through the biggest identity crisis. When this style first came out, typefaces like this were referred to as Classical. This was confusing because they weren't a new take on a classic style, like transitional was to old style. They were entirely new designs, and began a modern era of typography, so instead they became known as Modern. However, they're not really modern anymore, so now they're most commonly referred to as Didone (which is apparently a portmanteau of Didot and Bodoni, but Bodoni got the short end of that stick if you ask me...), in homage to the typefaces that pioneered this style. Sometimes you'll see them called Neoclassical, but it's not as common. I find this style the easiest to draw, because drawing a serif essentially involves drawing a short straight line. Create a lot of contrast between thick and thin strokes -- downstrokes should be quite heavy, while the thinner strokes should maintain a hairline width, matching the weight of your serifs. Add thin, consistently weighted serifs, with no bracketing at all. The serifs on this style tend to be pretty long. If you want your thin strokes to be thicker than a hairline, just make sure your thin strokes and your serifs are the same weight, the edges are square, and that you maintain strong contrast between them and the upstrokes. Slab serif type became popular in the 19th century as a display type. A commonly known typeface in this style is Rockwell. These typefaces have very heavy serifs with minimal changes in stroke weight, and no bracketing (when bracketing is added the style becomes Clarendon, which we'll get to!). This type style has a strong visual impact, so it was often used in advertising. It is also sometimes referred to as Egyptian. I like to use the follow-along sans serif technique when I start this style, which helps in maintaining a consistent stroke weight. Add square-edged, rectangular serifs that are the same weight (or very close to the same weight) as your letter strokes. These serifs tend to be short or medium length. This is sort of a sub-style of the slab serif, as it's not a very pervasive style and is seen in few typefaces. Like many others, this style is named after the typeface that pioneered it: Clarendon. Another display type style seen in the mid-19th century, the only difference between this and the slab serif is that it has gradual, rounded transitions into the serifs. Just as with slab serifs, their stroke contrast is very minimal and serifs are short or medium length. To draw this style, follow the slab serif instructions above, but add a rounded transition into each serif. Glyphic serifs are usually triangular and tend to be more visually subtle, resembling the style of chiseled Roman lettering. In additional to triangular serifs, the legs of letters like R or K tend to subtly flare out a bit at the end rather than having a full serif. A good example of this style is Saracen (above) or Albertus. You will often find glyphic typefaces under the name "semi-serif", but the terms "latin" or "wedge" are also pretty prominent. This is another serif style that doesn't have strong contrast between thicks and thins. The transition into the triangular serif can either be smooth or abrupt, depending on the typeface. To draw this style, draw a sans serif letter with minimal contrast between the thicks and thins, as with slab or old style serifs. Rather than a rectangle, draw triangles on either side of the stroke to form the serif. Subtly flare out legs at the end to give some additional visual interest. This isn't really a formalized serif style you'll find in most places, but it's what I use to lump in any of the serif styles that don't really fit in the other categories, like bifurcated, trifurcated, or illustrative serifs like leaves, flowers, curls, etc. There really is no one way to draw in this style, since it's kind of a catch-all category. The contrast between thicks and thins is entirely up to you. If you're doing a bifurcated serif to add a western vibe to your piece, that generally has only slight contrast between thicks and thins. If you're going for a botanical serif, maybe your entire letter is monoline, ending with serifs drawn out of two leaves! This is the serif category where you can really get inventive. Hopefully now you have a better understanding of the different categories of serif type, and how they relate to one another. If you were keeping count, we went through 19 different terms that can be used to describe 7 different categories of serifs - no wonder this is often a confusing subject! Personally, my favorite type of serif is probably Didone or decorative (love me some bifurcated serifs!). What's your favorite to draw? The pen tool is maybe the most important tool in all of Adobe Illustrator - it's the workhorse of the program, and your Illustrator abilities are pretty limited without it. It has quite a learning curve, but with practice, it opens up a whole new world of lettering possibilities. The pen tool can be used to transform your rough sketches into polished, vector (infinitely scalable!) lettering. At first glance, attempting to turn the sketch on the left into the polished type on the right seems pretty daunting, doesn't it? I promise, you can do it! Let's break it down into manageable steps. The first step is to take a rough sketch and take a picture or scan it. Since the resolution of the sketch doesn't matter, taking a picture in this case is all you need. Create a new document Illustrator, and use File > Place... to browse for your image and place it in the document. Resize as necessary to center it in your artboard. I like to lower the opacity of my image to about 50%, just to avoid any visual confusion with my pen lines. Then select the image, and click Object > Lock > Selection. This locks the image in place so you won't accidentally select it and move it. Before we've even started vectorizing, you can probably see how imperfect your sketch is - I already know I want to move the D in a bit, as it's a little too far out on its own, and I know my W is going to need to be narrower. When I know I'm going to be working with vectors in the end, I don't worry about making my sketch too perfect. It's far easier to correct mistakes on the computer than with further drawing! Before we start vectorizing our type, we need to go over a few basics of the pen tool. With the pen tool selected, click on artboard to create paths with straight segments. Create a point and hit Shift as you click to create your next point, to align the two points exactly to create a straight line. If you do this for all 4 points of a rectangle, all of your points will line up perfectly (this is especially useful for thick crossbars and straight down strokes). Click and drag to create paths with Bezier curves (the handlebars that stick out on either side of a point). If you hold shift while you click and drag, your handles will maintain a 0, 45 or 90 degree angle. Always drag your mouse in the direction of the next point you'll create. Just like when I'm sketching, I find it easier to build my vector piece with layers rather than trying to get it all in one shape. So we start again with the skeleton! Select the pen tool, and make sure it's set to a 1 pt. stroke with no fill. Create a line down the center of the stem of your D by clicking to create an anchor point at the top, and hitting shift as you click to create a second anchor point at the bottom. This will create a perfectly straight line. The bowl of the D is a bit trickier - it's made up of 5 anchor points. Anchor point 1: Click to create a point at the terminal (the very end) of the top serif of the D. Don't drag your mouse here - no need for this to be a curved point. Anchor point 2: Holding shift so your line is straight, click to create a point at the beginning of the bowl of the D. Continue to hold shift, and drag your mouse to the right to create a curved point with horizontal handlebars. Anchor point 3: Click again toward the middle of the bowl of the D, hold shift (after you click! ), and drag your mouse downward to create an anchor point with vertical handlebars. Anchor point 4: Create a point at the end of the curve of the D, lining it up as closely as possible to the same point at the top of the D. Hold shift, and drag your mouse to the left to create a curve with horizontal handlebars. Anchor point 5: Click to create an anchor point at the end of the bottom serif of the D to complete the line. Then, using the Direct Selecttool (the white arrow), go back and adjust any handlebars as needed to create a smooth curve. Let's pause for a moment to talk about proper handlebar protocol. Take a look at the handlebars above - they demonstrate a few key rules for creating handlebars that are easy to tweak and evenly share the work of creating the perfect curve. Don't cross the streams. (this is possibly my favorite tip I've ever learned from following Jessica Hische - this concept didn't really stick with me until I heard her phrase it that way). If you draw imaginary lines continuing each handle bar to infinity, none of them should be long enough that they cross into the other's paths. They cross into each other's paths when you give one way too much work to do creating the curve. Following this rule will ensure you're distributing the workload of creating the curve evenly onto each anchor point. Stick with horizontal and vertical handlebars. If you're just starting out, it's great that you're learning this now. You don't have any bad habits to break! Committing to horizontal and vertical beziers simplifies where you place your anchor points - your options are limited, because now, to get your curve along the outermost edge, you have to place your points at the outermost points of the curve! It makes narrowing down where your points are going much, much easier, and it also reduces the total number of anchor points you'll have, which makes tweaking the piece easier. I became much less overwhelmed with plotting anchor points once I committed to only using horizontal and vertical handlebars. Using these same techniques, draw out the rest of your skeleton. The bowl of the R is similar to the bowl of the D - the trickiest part of this letter is the leg, because it's so curvy. You'll create this with four anchor points: a horizontal handlebar at the top of the curve, a vertical handlebar in the middle, a horizontal one at the bottom, and a plain old corner anchor point at the very tip of the leg. A and W are very straightforward (pun intended) - just an anchor point at the end of each line, and short straight lines to create all of your serifs. To create the thicker downstrokes of our letters, we're going to use the pen tool to create filled shapes rather than strokes. I like to set my opacity down to 80% or so, so I can still see the skeleton underneath as I tweak the body. Creating the straight downstrokes is the easiest part. Using the pen tool, click to create the first corner point of the rectangle. Then, holding shift, click to create the other 3 corner points, and then click your initial anchor point. This will create a perfectly straight rectangle (and bonus, you can copy and paste this to quickly add the downstroke for the stem of your R)! Anchor point 1: Start by making an anchor point along the stroke of your skeleton. Anchor point 2: Create a curved anchor point just a little bit away from it, holding shift and dragging your mouse a bit to the right. Anchor point 3: You want your skeleton stroke to be along the center of your final downstroke, so create an anchor point a bit outside of that stroke to create the outermost part of your bowl. Holding shift, drag your mouse down to create the vertical handlebars. Anchor point 4: Create a horizontal handlebar curve at the bottom of the curve of the bowl. Anchor point 5: Make a corner anchor point inside the stroke of the skeleton. Anchor point 6: Make a curved anchor point just a little bit away from the corner point, holding shift and dragging your mouse a bit to the right to create the beginning of the inside of the bowl stroke. Anchor point 7: Create an anchor point inside your skeleton stroke, to create the innermost curve of your bowl. Holding shift, drag your mouse up to create the vertical handlebars. Anchor point 8: Create a curved anchor point at the top of the inner curve of the bowl, dragging your mouse a big to the left to create the horizontal handlebars. Now, we're right back where we started - to complete the shape, click your first anchor point again. To create the diagonal strokes of the A and W, I like to copy and paste the straight downstroke from earlier. Using the Direct Select tool, you can select just to top 2 points of the stroke and nudge them to the left to create the angle you need. For the A, you'll need to use the Add Anchor Point tool (in your toolbar, click and hold the pen tool, and select the pen tool with the + sign from the dropdown that pops up) to add an additional anchor point, so you can create the triangle edge at the top. From here, it's easy to make further edits. I knew my W was a little too wide, so I moved my shapes around a bit to make the overall footprint of the letter narrower. This is a big benefit of building your letters with layers of shapes - it's easy to make small tweaks. I also adjusted the kerning a bit by selecting all of the shapes making up an entire letter and nudging them around as a group. If you want to group the shapes that make up each letter, select them all and hit Ctrl + G. I don't like to actually join my shapes, as this raw, multi-layered version is much easier to tweak down the road. For example, you can easily select your just the skeleton and make the hairlines of your letters thicker or thinner, all with a couple of clicks. And voila! Now you have infinitely scaleable vector lettering! It might be a little difficult to get the hang of at first, but with practice, it becomes second nature. What do you have the hardest time with when using the pen tool? Sometimes, when you're focused on lettering every day you'll step back and look at your pieces and notice a sameness - you gravitate toward the styles you've gotten a better grasp of, and you stop challenging yourself. Or you notice you're not even looking for opportunities to get a little more creative or decorative with your type. When I notice this happening, I like to take a familiar word and try to style it up as much as possible. Wearing the same outfit every day is boring. Let's give your lettering some brand new clothes! Mono-weight sans serif type is usually how I finalize a layout, before I think about adding any style (unless that style will affect the layout, like something with a lot of flourishes or swashes). It's easy to grasp the layout when the type has a little body rather than just a skeleton, so you have a sense of their final visual weight, and you don't want to get bogged down in the details just yet. While this lettering style is fine, it's not exactly stopping people in the street. Here are 8 ways to dress that baby up (and yes, you can use more than one!). Try varying the contrast of your strokes. If your pen would go down, or down and to the right to form a stroke, that stroke should be thicker. If your pen would go up, or up and to the right, that's a thinner stroke. If you need a refresher on upstrokes vs. downstrokes, this post on script lettering will help. Thicker downstrokes and thicker upstrokes go beyond script type! There are endless crossbar styles out there, all of which will add some personality to your piece. In this case I went with a diagonal, but you can make your crossbar high, low, curved, or even represented by a circle floating in between your strokes rather than a connective bar. Anything that creates a visual bridge between the two strokes you need to connect will work. Certain crossbars will evoke a certain time period of typography - very low crossbars tend to feel midcentury, whereas high crossbars evoke an art nouveau, early 1900's style. Spurs are small projections off of the main stroke of a letter. They can be added to the terminals of letters as a type of serif, or added around the middle of a letter (called a median spur) for some additional interest. Median spurs often lend a bit of a Western feel to lettering. Decorative serifs are one of my favorite ways to make text stand out. Styles you'll see frequently include bifurcated (what you see above), trifurcated (similar to above, but with an additional third curve), and ball terminals (transitioning terminals of strokes into a ball, like in the typeface Mastadoni). You can also experiment with illustrative terminals, like serifs that look like leaves or other botanical elements. With ornamental or illustrative details, the sky is the limit. You can keep it simple, adding shapes that follow the curvature of the letter (I’m partial to a dot at the median with two teardrop/petal shapes following the stroke), or add small illustrations that relate to the meaning of the piece. If it’s a piece mentioning the outdoors, you can add leaves or flowers to the inside or outside of your lettering. 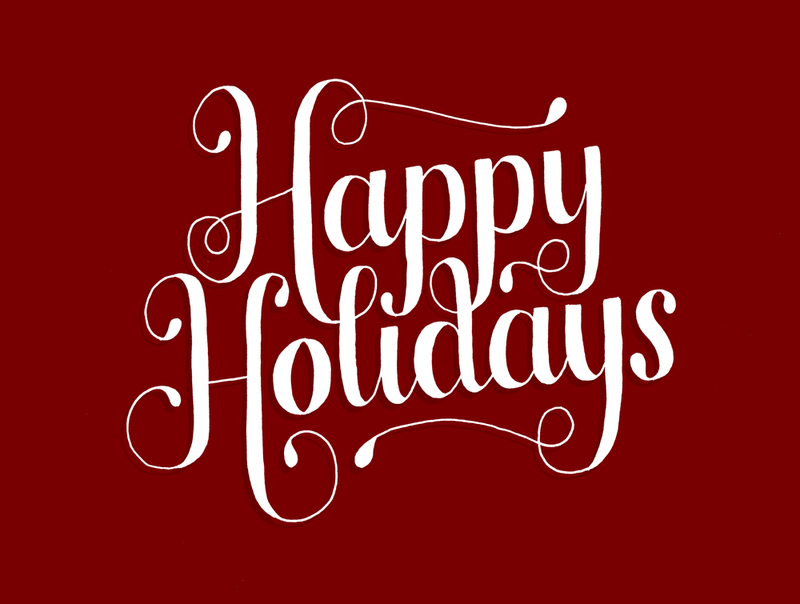 If it’s about winter, you can add some snow sitting on the top of each letter. Another way to dress up plain lettering is to add hairline strokes inside your type - either straight through the middle, like above, or by following the outline of the letter to essentially create another small version of the letter inside. You can even get crazy and add drop shade to your inline, to give your piece additional depth. I’m a big fan of 3D type - it can be used to instantly make important words stand out, and there’s more than one way to create a 3D effect. The most common way is to add a drop shade at a consistent angle, and connect that shade to your original letter. You can have all of the shade receding toward a single perspective point, or add lines and shading to create 3D facets within your letter. You can also change how you fill in the 3D type - with line details, a solid color, or shaded based on the angle of your imaginary light! For a really fun effect, when you ink your drawing, try shading in and outlining only the 3D portion of your lettering. The letters will still be easy to read but will actually be created by the negative space! A drop line or shadow is a quick and easy way to give your lettering a little dimension and make it stand out from other letters. I tend toward adding my shadows down and to the left, but just make sure you consistently follow the same imaginary light angle throughout your piece. With these 8 different style options (and many possibilities within each option), there are a million different ways to stylize a letter, especially if you combine them! Examples of wonderfully stylized type are everywhere. If you feel your styles have gotten stale or repetitive, look to type from different periods for inspiration! Hopefully these examples gave you a little inspiration for your current projects. I'd love to see what you've created - share a link to your latest work in the comments! 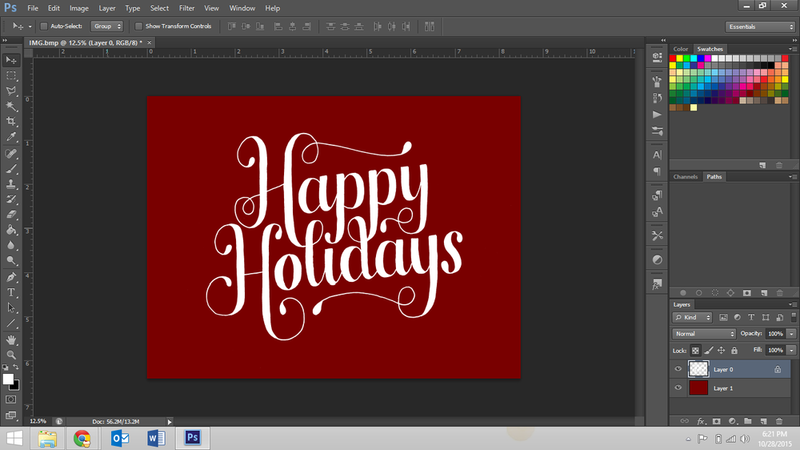 Photoshop is easily my favorite method for digitizing my hand lettering. It's quick compared to other methods, and it maintains all of the character (and slight imperfections) of your original drawing. You won't end up with a vector image (an image based on paths rather than pixels, which can be scaled infinitely without ever looking pixelated! ), so it's not a viable option if you need to make a small drawing very large. But it works wonderfully when your original drawing is close to the final size you need. So, today we'll be looking at how to digitize through Photoshop. To start, grab your finished, clean, inked drawing. If you have a couple of stray ink spots or minor imperfections you aren't happy with, that's OK - you can clean them up digitally! I scan my drawings in at 600 dpi. I find this method works best with a scan rather than a photo, as a photo just isn't going to be high res enough. If you scan in a black and white drawing using the File > Importoption, it's probably going to scan in as a bitmap. Go to Image > Mode > Grayscale... and convert the image before you do anything. You're going to be using the Magic Wand in a few minutes, and it doesn't work with bitmap files. Leave the size ratio as 1. After Grayscale, you can convert the image to RGB (for web) or CMYK (for print), so you can add some color in a bit! Next, I go in and erase any stray ink, dust, or other specks that I don't want in my final piece. I also use the Brushtool to fill in any spots within the letters I might have missed, and crop the piece to the size I want. Once you're happy with the cleanliness of your piece, right click your Background layer in the Layers panel on the right hand side of Photoshop, and select "Layer from Background." It should now be called Layer 0. You should get in the habit of naming your layers appropriately, but I am admittedly horrible about this. 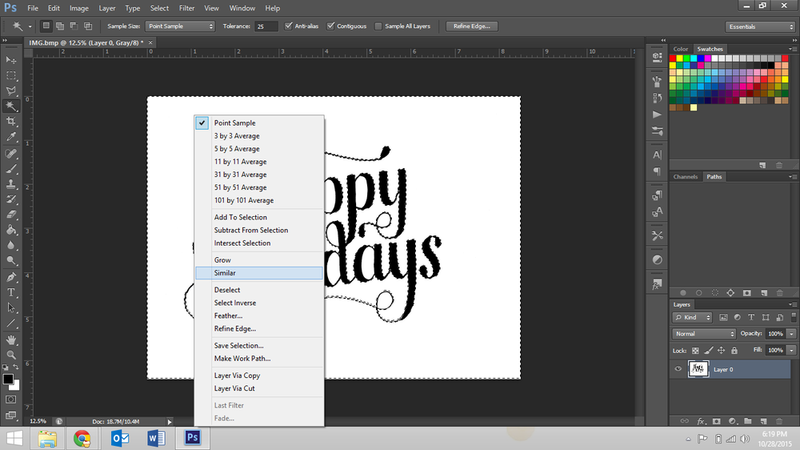 Then use the Magic Wandtool to select all of the white spaces outside of your lettering. You can select the largest piece of your background, right click, and click "Similar" - this will select all of the other white spaces in the drawing. Then press delete. Now you have isolated your lettering! Caveat: If you haven't done a thorough job filling in any white spots inside the fill of your letters, using the "Similar" feature will select them too. The other option is to just manually Shift+Click with the Magic Wand on all of the individual white areas (like counters and the inside of any flourishes) you want to delete. Once you've isolated your text, hit Ctrl + Shift + N to create a new layer. Drag this layer in the Layers panel so that it's under your lettering layer, and make the background whatever color you want. I'm sticking with white for now. 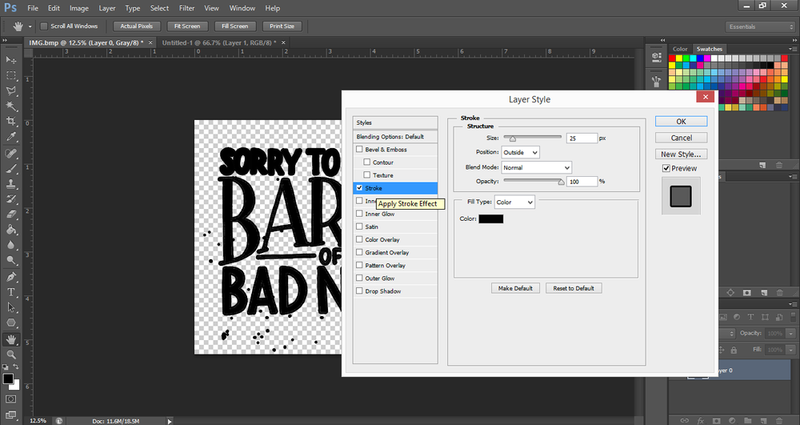 Select the layer with your lettering, and click the "Lock Transparent Pixels" box in the layer panel. This locks all of the pixels on the layer, so any editing you do now will not affect the structure of your lettering - just the color or effects on it. Transparent pixels will remain transparent, no matter how many times you click on the transparent area with a brush or paint bucket. Select the color you want your final lettering to be, and sweep the brush tool across all of your lettering - only your lettering should be affected by this! 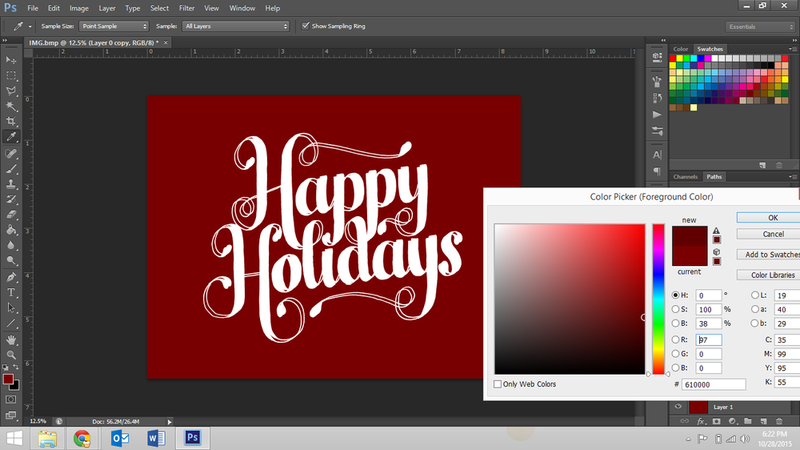 I chose white for my letters, and changed my background to a deep red using the Paint Bucket, for a nice holiday color palette. Now it's time to add any additional effects you like. I like to add a little drop shadow behind my text, to give it a little extra depth. Duplicate your lettering layer (right click on the layer in the Layers panel, and click "Duplicate Layer") and drag it so it's below your original lettering layer. Nudge the duplicate lettering a bit down and to the left using your arrow keys, make sure Lock Transparent Pixels is selected, and choose a color a bit darker than your background layer. Use the brush tool to color all of the duplicate layer of lettering that color, and voila - a simple drop shadow! If it's a little too dark, you can drop the opacity of the layer a bit. That's it. Seriously. If you want to explore adding textures to some of your layers, now's the time, but you have a fully digitized, ready-for-print piece! You can still see every imperfect line or rough edge from my original drawing, and that's why I love about this digitization method. Sometimes, a piece calls for the more perfect edges or a vector file, like if you're hand lettering a custom logo, but generally, I want the organic, hand-drawn look for my work. All of the prints in my Etsy shop are prepared this way. Got any questions, or additional Photoshop tips I missed?